In Nintendo’s pre-E3 briefing today, Nintendo president Satoru Iwata unveiled some new details about the Wii U controller. The controller itself has gotten a bit of a facelift, with an altered button layout meant to make essential controls more accessible. The + and – buttons have been moved up the sides of the controller from the bottom. The slide pads have transformed into full-blown analog sticks, and Nintendo has finally caught up with Sony and Microsoft by allowing the sticks to be depressed in order to act as new buttons. The controller has gained some new functionality as well. First of all, an NFC reader has been built in. Rayman Legends trailer showed off this functionality being used to bring action figures to life inside the game space. The controller also functions as a universal IR remote, so you can use it to primarily control your TV along with your Wii U console. An Internet browser is built directly into the controller itself, and the controller seems to be able to access new Wii U-based social networking functions, such as message boards, in the middle of gameplay. There also appears to be a type of Pictochat style program that lets you share text and drawings with the console, and other friends over the Internet. Of course, the controller still has a built-in camera, touchscreen, motion sensors, and all the other good stuff we saw at last year’s E3. You can still use the tablet for video chat, harness it for augmented reality functions, and take photos and video with it easily. Also, if the video footage we’ve seen is any indication, the controller appears to come in sleek black. We will get to see the controller fully in action at Tuesday’s Nintendo press conference and will have hands-on time with the controller over the course of E3. 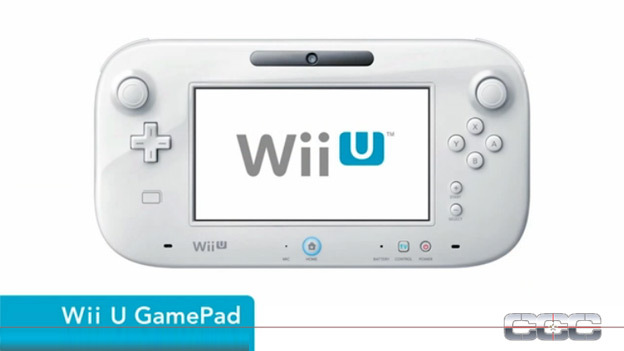 Stay tuned for more Wii U news!